In a previous piece for Quintessence, I wrote about Supported Self Management (SSM) for mood problems, surprisingly effective despite minimal cost and easy implementation. SSM involves teaching patients evidence-based methods for dealing with depression more effectively. The patient is provided with the Antidepressant Skills Workbook, available at no cost at www.carmha.ca/selfcare/, along with some support from a healthcare professional, peer support worker or family member. The skills taught in the workbook are based on cognitive behavioural therapy. The aim of our research group (CARMHA) at Simon Fraser University in Vancouver has been to disseminate this workbook to Canadians dealing with mood problems. This is an ambitious and probably absurd goal, but we have been doggedly spreading the word. Despite having a limited dissemination budget (to be honest, no budget) we have achieved an astonishingly high level of uptake. 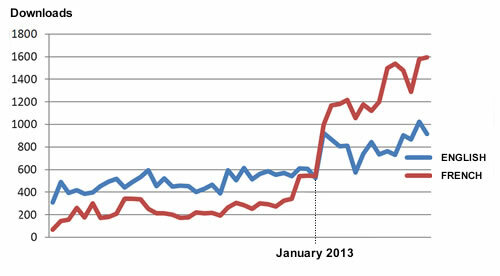 Here are two graphs showing downloads of the Antidepressant Skills Workbook. The first one shows the total number of downloads for this workbook between 2009 and 2013: a gradual increase of the download rate until a specific inflection point in January 2013, when downloads began to escalate quickly, with a much larger increase for the French version. By late 2013, the English version reached 900 downloads per month, while the French version reached 1600 per month! 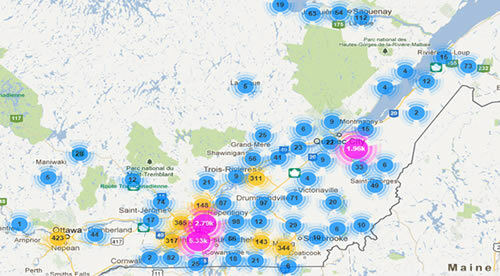 The second graph shows the geographic distribution of downloads, specifically in Quebec. It illustrates the impressive distribution of downloads across the province. Why has the self-care material received such wide uptake across the country? Why did the rate of uptake abruptly increase about a year ago? Why did it increase so dramatically in Quebec? One way to look at this is in terms of nonlinearity, involving unpredictable effects from interactions occurring within a complex system. It can happen that “a small change at one place in a deterministic nonlinear system can result in large differences to a later state.” This is called the butterfly effect, invoking a colourful metaphor in which the formation of a hurricane may depend on whether or not a butterfly flapped its wings weeks earlier. The wide uptake of our self-management tool, despite virtually no promotional activity, appears to be a fine example of the butterfly effect. But it still leaves us searching for specific answers to the three questions posed above, answers that would help us to disseminate this and other innovative mental health practices. Litaker, D., Tomolo, A., Liberatore, V., et al (2006). Using complexity theory to build interventions that improve healthcare delivery in primary care. Journal of General Internal Medicine, 21, S30-34.